This weekend was yet another great one. It was four days for me and I spent Thursday and Friday sleeping in, shopping around, and watching ridiculous shows (Why does Flea Market Flip exist? And why did I watch it for an hour?). It was great! On Saturday, Andrew and I made a Trader Joe's run and ate lunch at Zabak's near the Galleria (really good, cheap Mediterranean - I recommend!) We went to our friends' house that night with bottles of Two Buck Chuck and had a great time. They have three sons, ages four and under, and put us in charge of the youngest who just turned one for about twenty minutes while they got the other ones to bed. I think Tammi was trying to give me a case of baby fever, but luckily, it isn't contagious! 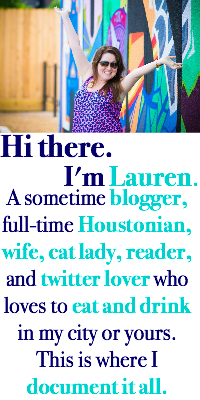 On Sunday, I faced my anxiety (because fear is too strong of a word) and went to the Houston Blogger Meet-Up. I didn't know what to expect and I actually had a dream about it the night before - that I showed up, my clothes weren't right, my hair wasn't right, and I immediately alienated myself by the first thing I said - so I had to give myself a pep talk to be able to go. But, I am really glad I did. All of the blogger girls were so open and they were all chatting like they had been friends for years, when I learned that some were only on their first or second meet-up. It was a fun way to connect and a great way to learn about new blogs to read. This week is the week that I love/loathe the most for my job. We are hosting 45 other law schools in a competition that lasts from Wednesday - Sunday. There are events every night so I live in a hotel and work via iPad and phone (so, sadly, no time for blogging - let's talk via twitter instead?) It is so tiring but so rewarding if it goes well. Crossing my fingers! Any tips for blogging on the go? I use my iPhone app. Good to meet you! I write blogs on notes in my phone and then post it later. Or the iphone app like Tess said! I just forget I'm supposed to be blogging entirely... whoops. Don't follow my lead though! I want to hear from you! Haha.